Angry Barnyard BBQ is now open on 18th Street. 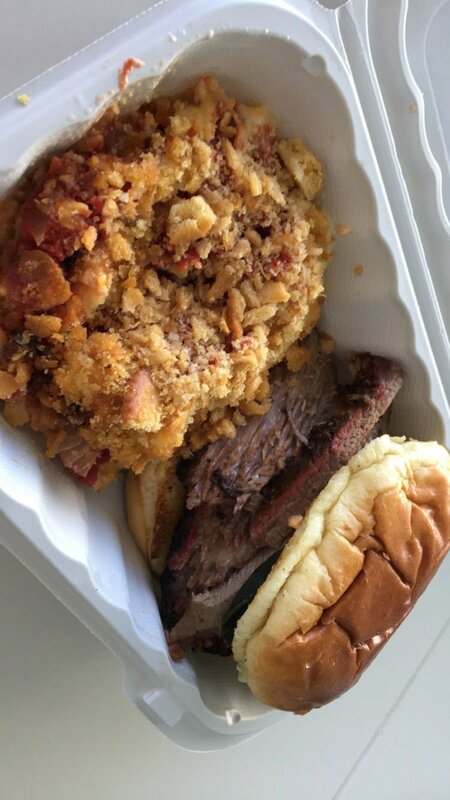 The big hoss sandwich (brisket with housemade Southern pimento cheese and barnyard pickles) with tomato pie on the side from Angry Barnyard BBQ. The interior of Angry Barnyard BBQ, now open on 18th Street in downtown Bakersfield. Trailer trash casserole with three pepper sausage from Angry Barnyard BBQ. Roasted corn salad from Angry Barnyard BBQ. 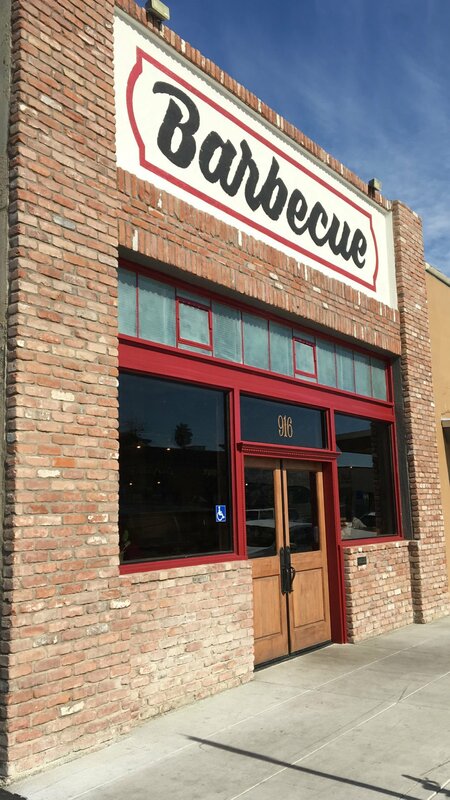 Decked out in modern decor, the barbecue spot across from Cafe Smitten is the second location for Angry Barnyard, which operates The Barnyard at Match Point Grill at Bakersfield Racquet Club. The menu isn't overly complicated, offering "Southern comforts" ($15) consisting of a choice of two meats (brisket, pork, turkey, ribs, chicken, tri-tip and Cajun or three-pepper cheddar sausage) and two sides (cheesy pepper grits, greens and ham hocks, mac 'n' cheddar, tomato pie, chili beans, fried okra, coleslaw, country caviar or potato salad) for $15. That comes with choice of sauce (Carolina gold, Alabama white, gentleman's classic or sassy Southerner), buttermilk biscuit or cornbread and barnyard pickles. If a sandwich is more your speed, there are three specials (all $13): the big hoss tops brisket with housemade pimento cheese and barnyard pickles; the fat Moe combines smoked pork and Cajun sausage topped with coleslaw and choice of sauce; and the SOS dog smothers split sausages of your choice with mac 'n' cheddar (a portion of proceeds goes to SOS Dog Rescue in Bodfish). There is also a build-your-own sandwich option ($11). The bun was a little big for the big hoss but the cheese paired well on the brisket with a tangy bite from the pickles. Speaking of tangy, the tomato pie had a nice richness enhanced by the crushed Ritz crackers on top. There are also three local favorites: trailer trash casserole ($8), covering corn chips with chili beans, cheddar cheese and your choice of meat; loaded tater ($9), a giant russet potato stuffed with butter, sour cream, cheddar cheese, chili beans and meat of your choice; and roasted corn salad ($6), which is similar to esquite (Mexican corn cup) with butter, mayo, cotija and Cajun seasoning. Both the corn and casserole are early favorites of this local and easily shareable among two to three diners. Don't forget dessert with options of coconut cake ($4), buttermilk pie ($3) and banana pudding cake ($3). Three specials are available only on Fridays. Grandma's fried catfish, chicken and sausage gumbo and beignets, which are light and crisp, a perfect way to celebrate TGIF. Angry Barnyard BBQ (916 18th St.) is open from 11 a.m. to 6:30 p.m. Monday thorugh Friday and 11 a.m. to 3 p.m. Saturday. For more information, visit angrybarnyardbbq.com or facebook.com/angrybarnyardbbq.